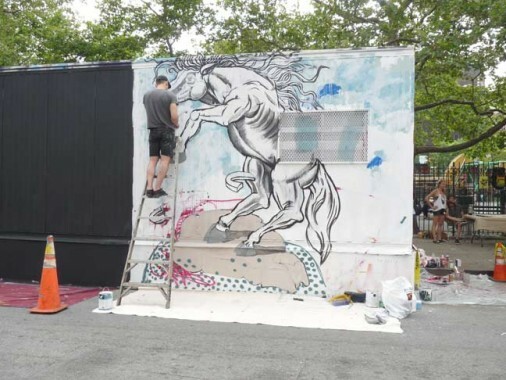 East Houston Street is the game-changer in Manhattan, dividing the club of streets with names of southern Manhattan Island from the fraternity of streets with numbers (and a few letters) on the island north of it. Thus, at East Houston, Columbia becomes Avenue D; Pitt becomes Avenue C; Clinton becomes Avenue B; Essex, Avenue A; Allen, 1st Avenue; and Chrystie, 2nd Avenue. West of that, no numbered Avenue gets as far south as Houston except 6th Avenue, and it didn’t do so until 1928, long after the overall grid pattern had been set in stone. 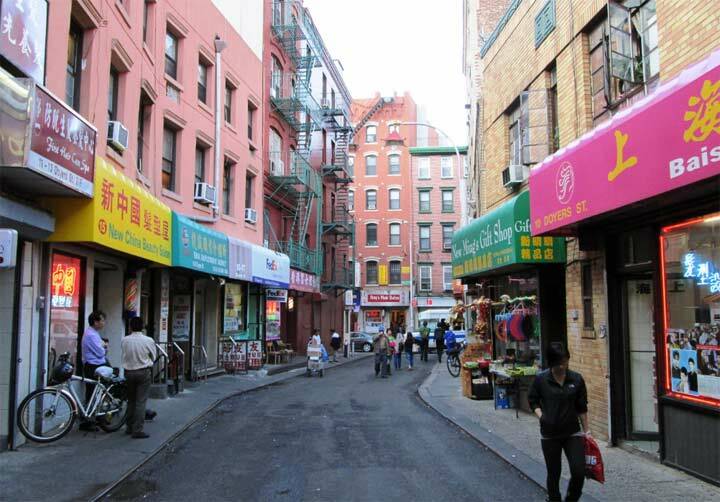 East Houston Street has been monkeyed with repeatedly since it was first laid out in the early 19th Century, though most of the shenanigans have gone on during the 20th Century. 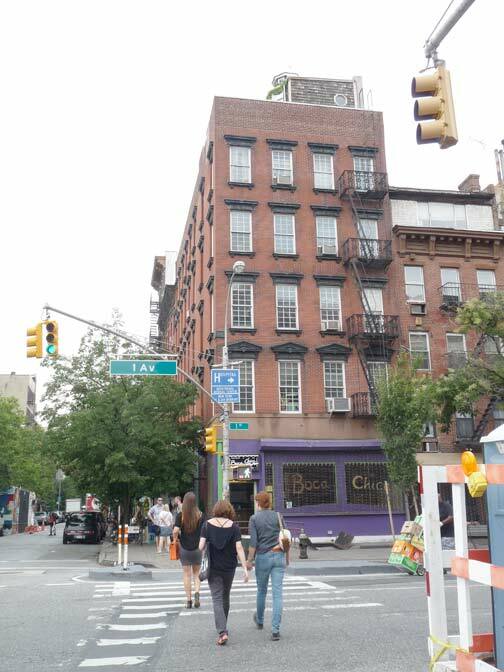 Before 1933 or so, it was a narrow 2-lane street, comparable in width to its pals Stanton, Rivington and Broome. In the early 1930s, most — though not all– of the buildings on the south side of the street were condemned between Essex and the new 6th Avenue southern extension so that the IND subway — now the F train–could be built more easily under the street. That, though, left Houston with a lot of empty lots that were filled with transient structures and shacks until a general street widening, making Houston the roaring throughfare it is today, was begun in 1957 and completed in 1961. Houston doesn’t run parallel to the east-west street grid that it partitions from downtown. Thus both East 1st Street and East 2nd Street run into it before Houston Street itself is brought to a close at the FDR Drive. This situation makes for some unusual parks and triangles, a couple of which we will see here. A quirk in the street grid layout brings 1st Avenue and East 1st Street together just a nick north of Houston. Nearby, 2nd Avenue and East 2nd also intersect. That is the sum total of intersections in Manhattan with the same number. 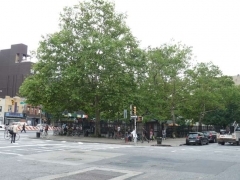 There are none in the Bronx or Staten Island; Brooklyn has a few in Park Slope; and Queens, with its overwhelming street numbering, has dozens. Here’s what I found at 1st and 1st. For one thing, there are a lot more than two 1’s here, as we’ll see. There’s a neat little 5-story apartment house on the NW corner of 1 and 1, with 12 over 12 windows and a couple of eateries on the ground floor. 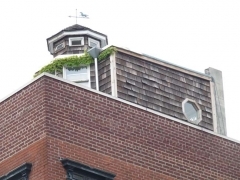 There’s also a beach house on the roof. I went where I usually go in situations like this, to Nick Carr’s Scouting NY. 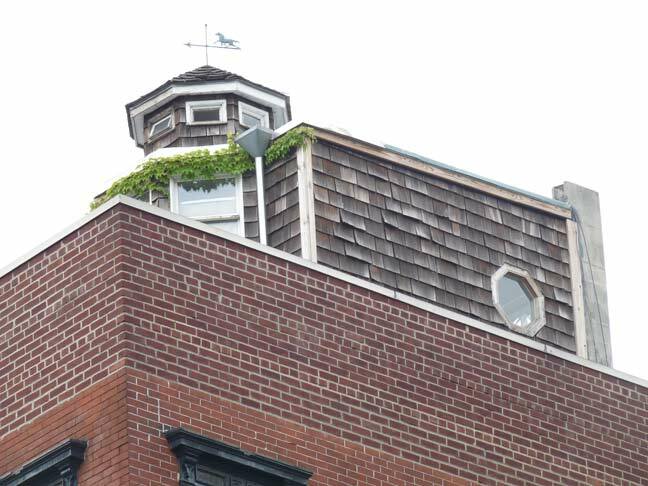 He has some nice photos of the beach house with its cupola and weathervane, but no idea about how and when it got there. It just joins the many other quirks along or near East Houston, like the scrambled clock and statue of Vladimir Lenin. I have mentioned there are a lot more than just two 1’s at 1st and 1st. 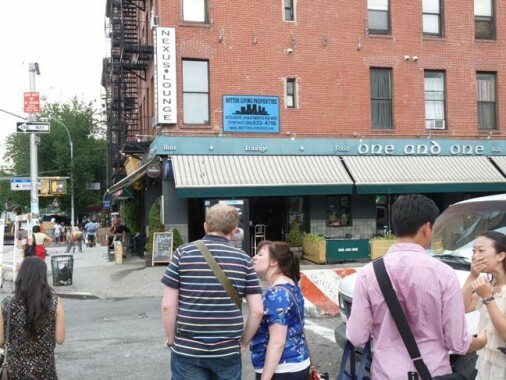 Here are four more, if you count the, er, ah, ones on the signs at the One and One tavern on the NE corner. So far, that gives us six. The two one-way signs on the stoplight give us eight. 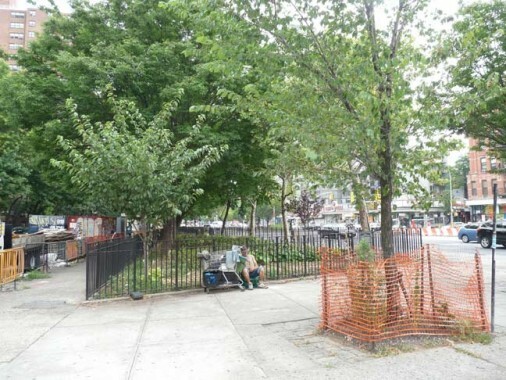 First Park occupies a substantial part of the wedge of land west of 1st Avenue between East Houston and East 1st. 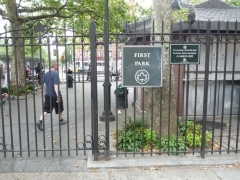 It first opened in 1935 and was substantially renovated, with a new kiddie playground, in June 1997, when then-NYC Parks Commissioner Henry Ster gave it its present name. Stern, who was fond of quirky or esoteric names, gave it a new, obvious name, after the dominant number in the area. 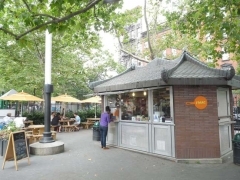 The park has a frequently-changing food concession, in 2012 S’Mac, which specializes in mac and cheese. 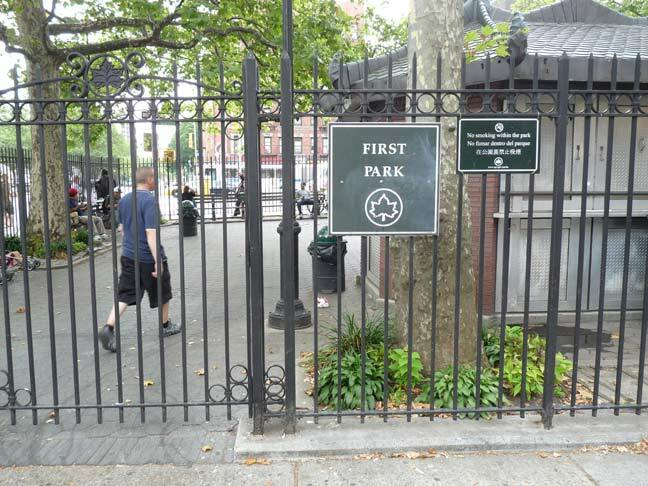 The First Park sign brings our total of 1’s at this intersection to nine, and the one-way sign on the stoplight on the corner of the park brings it to ten. NYC, the city that never sleeps, is also the city that is ever-changing. 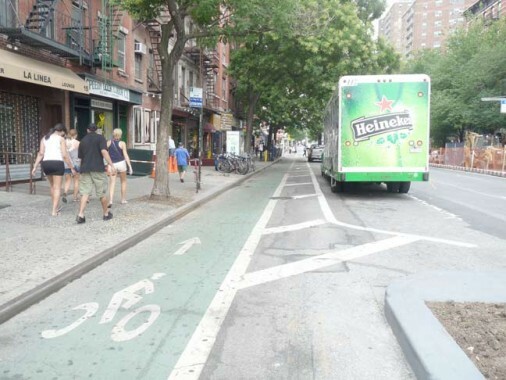 An express bus lane is being built on the east side of 1st Avenue, joining the bike lane on the west side. 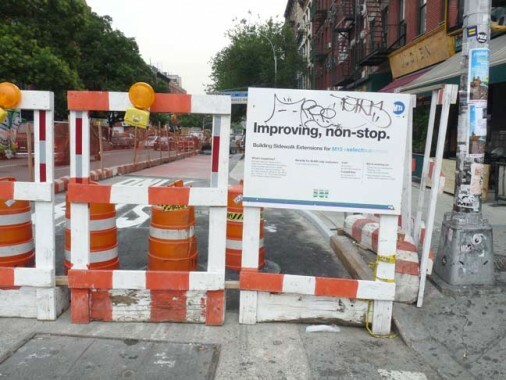 For auto traffic, at least, 1st Avenue will soon be so skinny it will resemble its titular number. 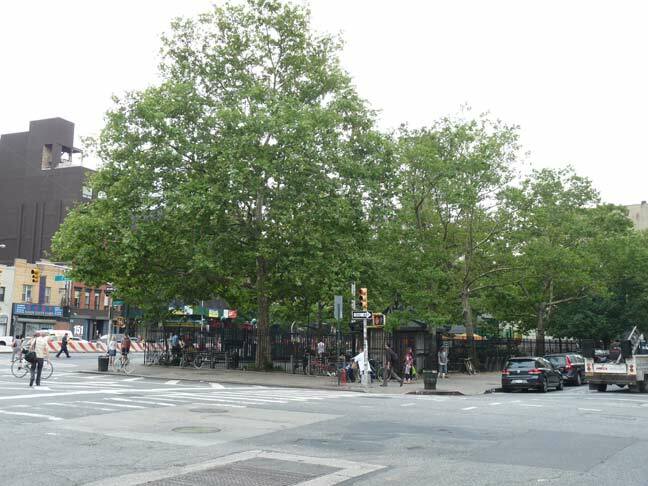 PERETZ SQUARE is the narrow green spit east of 1st Avenue filling the triangle as East 1st Street gradually succumbs to running into East Houston and ending before it reaches Avenue A. 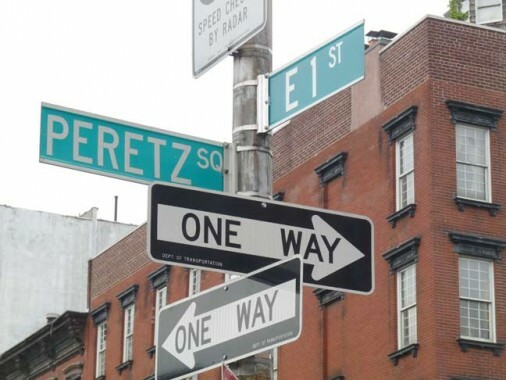 The “square” was named in 1952 for Isaac Loeb Peretz (1851-1915), an attorney, author, essayist and poet born in Poland under Russian rule. He wrote primarily in Yiddish and was known as the “Great Educator” of the Jewish masses. The two one-way signs, as well as the East 1st Street sign, bring our total of 1’s to thirteen. 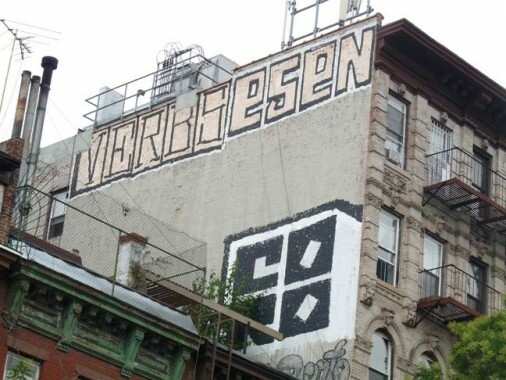 The street art on the midblock building on the west side of 1st Avenue between East 1st and 2nd Streets was placed on top of a whitewash job that, in turn, covered over an aged Fletcher’s Castoria ad in florid script that has been there for 8 or 9 decades, at least. 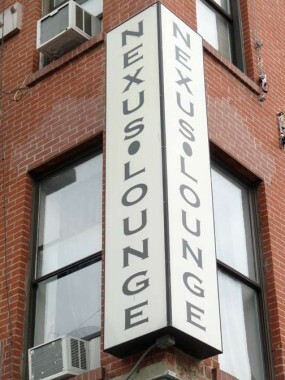 The Nexus Lounge, which shares space with the One and One tavern, is cleverly named. Why? And who knows, maybe he was right. Meanwhile, on a pole on the NW corner, two street signs plus a one-way sign bring our total of 1’s at the intersection of 1st and 1st to sixteen, which I think is the grand total, unless somebody can find another, er, ah, one. Joel Russ opened a pickled herring shop on Orchard Street in 1914. 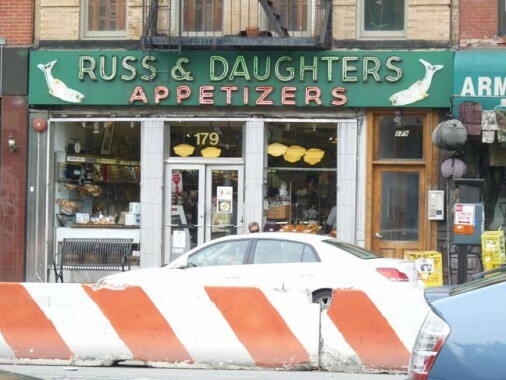 According to Historic Restaurants and Shops of New York, Russ had an irascible, argumentative personality, not an asset in the retail biz, so he put his three personable daughters to work behind the counter. The business evolved into a gourmet seafood deliacies emporium, still with a vintage 1940s neon sign. One of the daughters’ grandsons runs the shop now. The neon sign lights up blue, red and green at night. 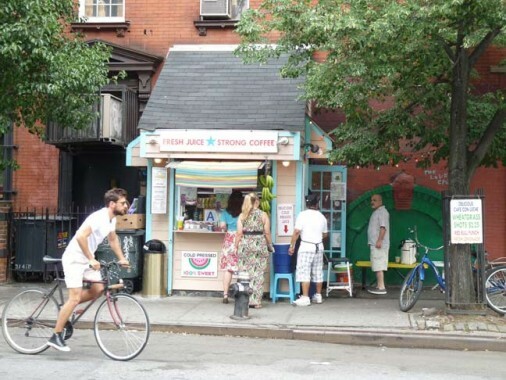 “Fresh Juice Strong Coffee” stand on East 1st outside the building with the beach house on the roof. 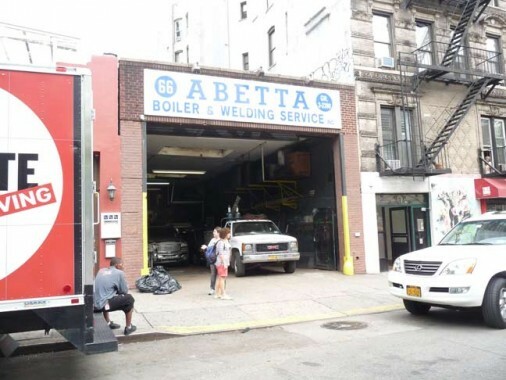 Long before the East Village started getting expensive and yuppie-ized, it was home to places like Abetta Boiler & Welding Service at 66 East 1st. 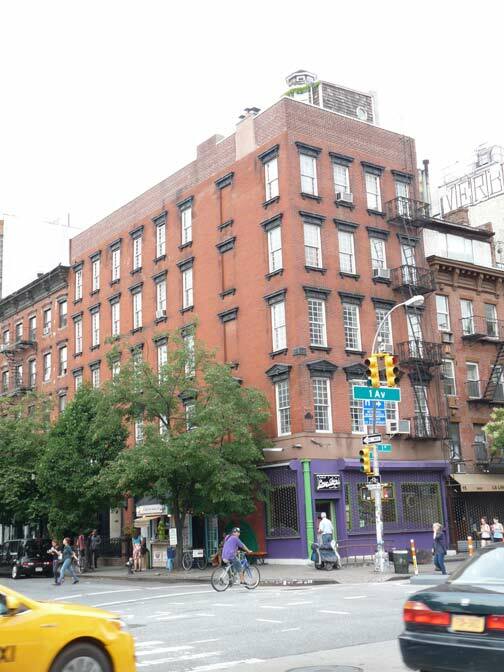 The massive apartment building at 40 East 1st, between 1st and 2nd Avenues, gives hints of having been a bigger deal. 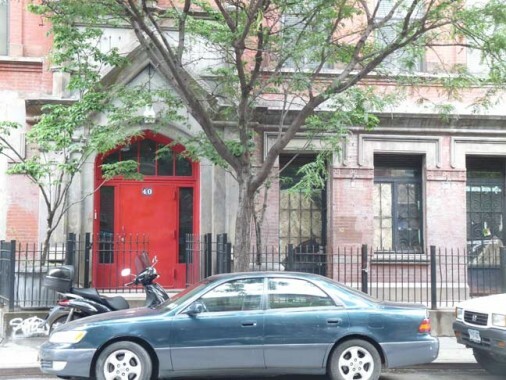 It was — it was once PS 79 and was built in 1885. Catholic Worker, St. Joseph’s Hospitality House, 36 East 1st Street. Minor correction: Seinfeld was set on the Upper West Side. The address Jerry gave on the show was 129 West 81st Street. 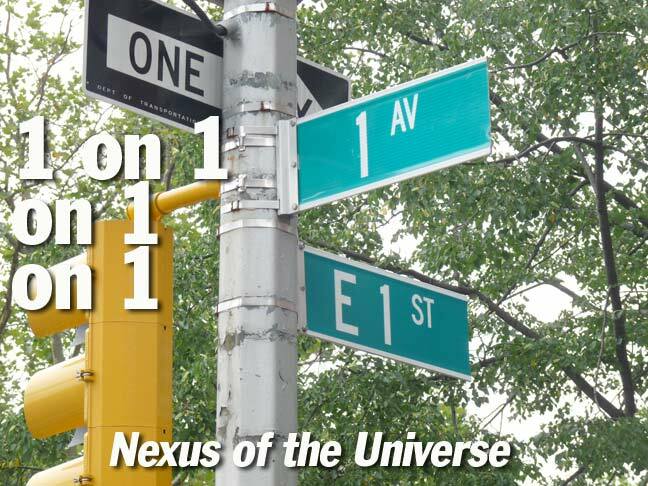 There’s also a wormhole at 1st and 1st that will whisk you off to the Andromeda galaxy. It happened to my friend Bob Sacamano once. Just an FYI. From 35 East 1st up to 2nd ave. there is a huge rat problem. This has been going on at least 10 years,I know this from personal encounters with the vermin. Anyone walking on this part of the block should be aware. It’s interesting to see that the street sign that marks First Street as it crosses First Avenue says E (for East) 1 ST. In the early street guides (Geographia, for example) most Manhattan streets have separate entries for their east and west branches, as is the case today. First Street (and I believe Second Street, as well) was listed simply as First Street; no east or west. 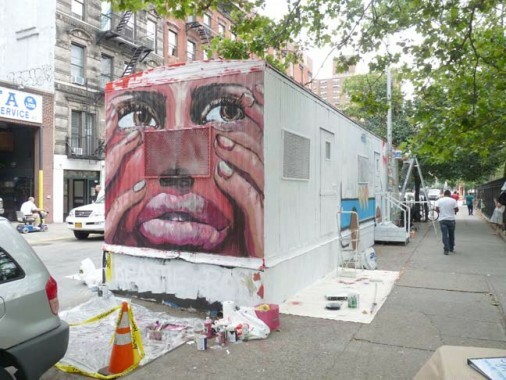 This was so since First Street ended at, I believe, The Bowery. Thus , if there is no West First Street, it is not necessary to give the only First Street the “East” designation. 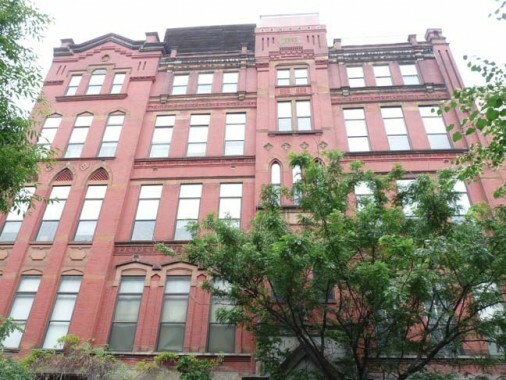 At 108 East 1st Street (so right near 1st and 1st) is a former synagogue that is now private residences. It had a few different congregational names. There is still a large Jewish star and Hebrew writing on the gate and a few other spots. FYI “One and One” is the vernacular way of referring to fish and chips in Dublin. 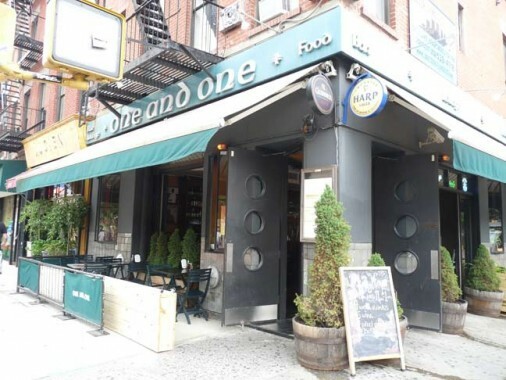 The One and One restaurant serves fish and chips, so no doubt they had this in mind, in addition to the “nexus” at 1st Avenue and 1st Street. 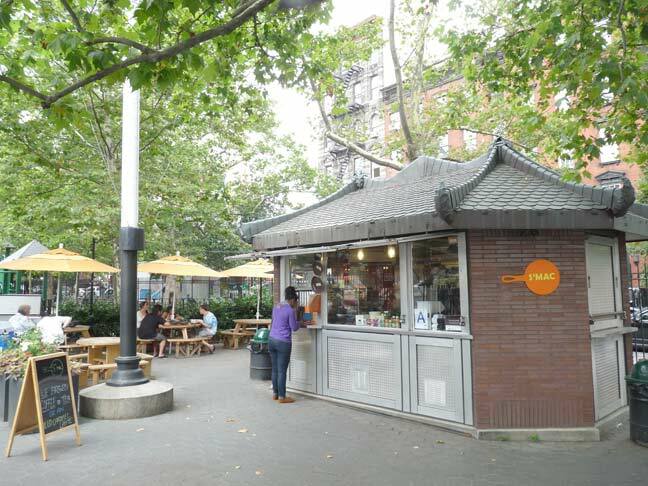 Reading this One on One web page about 1st St and 1st Ave., brings back a flood of memories. I lived just west of the corner on the north side of 1st St in 1980. It sure does looks like it has changed a lot. When I was there it was edgy and a bit dangerous sometimes. I was mugged across the street from where i lived. 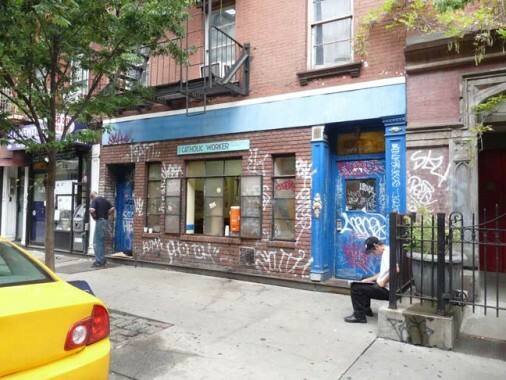 If I recall correctly there was a subway stop between 1st St and Houston St. called 2nd Avenue. I wonder if it is still there? What a great thing you have done creating this Forgotten New York website. Very cool. I loved living in the city that never sleeps at night. Thanks for the memories! I’ll have to pay a visit again soon. Everyone concern about censorship n media control should join mě in E.Village to fight it.I am pushing upgrade i..q for.space society with its need for hi-tech educated,not manuál laborer,truck drivers etc.i.q must. Be 120plus.